Pre-Requisites: Access Developer Level 3 strongly recommended, as you should watch all of my classes in order. However, if you're skipping around, you should have at least completed the Beginner series and the first 3 or 4 levels of the Expert series where I start to cover functions. This class continues our look at programming in Visual Basic for Applications in Microsoft Access (VBA, or Access VB). We will begin by adding notes (long text) to our order details. We can have notes for the order as a whole, but not for each line item. This information is stored in the product table. We will use DLOOKUP to pull it when we add the item to the order, and allow the user to edit it. We will learn how to use the OnDblClick (on double click) to allow the user to make the field larger to see and edit the notes better. We'll modify the object's height and width properties. We will learn about variable scope - how certain variables only work inside a particular procedure, but others can work over an entire form as long as it's open. We will then add these notes to the printed invoice as well. Next we will go back and work on our employee commissions form. Before we just had it so that the manager could type in an employee, a date, an amount, and log some commission. 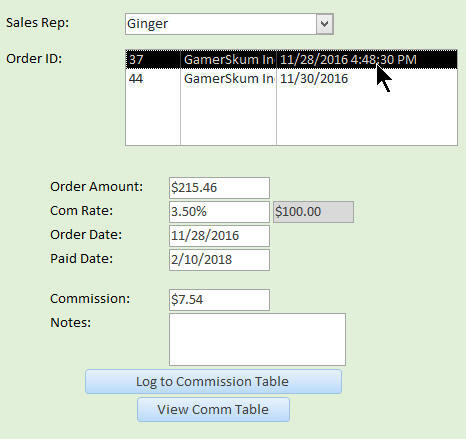 Now we will actually tie those commissions into the order system, so that you select an employee from a combo box, pick an order, and then the system will automatically calculate the commission amount and then track which orders have had the commissions paid. We will start by setting up brackets for each employee so that the commission rate can be variable based on the amount of each order. So, for example, if employee 3 has an order that's $90 then she gets paid a 3% commission. However, a $350 order will get a 4% commission. Then, we'll make it so that on the commissions form, you select an employee, then a list of their unpaid (commissions) orders will show up. Click an order and the data is all automatically calculated. Click the LOG button to save the info in the commissions table, and the list updates. This is the 4th class in the Access Developer series. If you're serious about building quality databases with Access, and you want to learn how to automate your database with VBA Programming then don't miss out on this course. Of course, if you have any questions about whether or not this class is for you, please contact me. Richard on 2/10/2018: Access Developer 4 continues our in-depth study of Visual Basic for Applications programming with Microsoft Access (Access VBA). If you're serious about building quality databases with Access, and you want to learn how to automate your database with VBA, then don't miss out on this course. Contents include: - Notes on Order Details - DLOOKUP from Product Table - Change Size of Field in OnGotFocus - Constants, Const Keyword - OnDblClick Event - Sales Commissions by Order Amount - Commission Range Brackets - DMAX and DLOOKUP together - Use SQL to Load Order List - Lots more Click here for more information on Access Developer 4, including a course outline, sample videos, and more. This course was recorded using Access 2016, but most of the topics covered are valid for all versions of Access from 2003 on. This class follows Developer Level 3. The next class in the series is Developer Level 5. Kenny N on 2/14/2018: Thanks so much for the tip on the Dim statement! I never realized I was inadvertently dimming my variables as variants because I was not writing out my variable types individually. That explains some mysterious error messages I have been getting when trying to pass variables to subs and functions!